Definition at line 44 of file SliderDialog.h. Definition at line 76 of file SliderDialog.cpp. References CWindowInterface::addToMainWindow(), C_INVALID_INDEX, CQIconResource::copasi, createNewSlider(), editSlider(), CQIconResource::icon(), init(), mpaCreateNewSlider, mpaEditSlider, mpaRemoveSlider, mpaResetValue, mpaSetDefault, mpContextMenu, mpParentWindow, mSliderMap, mTaskMap, removeSlider(), resetValue(), runCrossSectionTask(), runLNATask(), runMCATask(), runOptimizationTask(), runParameterEstimationTask(), runScanTask(), runSteadyStateTask(), runTask(), runTimeCourse(), setCurrentFolderId(), and setDefault(). Definition at line 371 of file SliderDialog.cpp. References clear(), mpParentWindow, and CWindowInterface::removeFromMainWindow(). Definition at line 408 of file SliderDialog.cpp. References CCopasiVector< T >::add(), CSlider::compile(), editSlider(), equivalentSliderExists(), findCopasiSliderForCSlider(), CopasiUI3Window::getDataModel(), CCopasiRootContainer::getDatamodelList(), SCopasiXMLGUI::getSliderList(), mChanged, mCurrentFolderId, mpCurrSlider, mpParentWindow, mSliderMap, removeSlider(), setCorrectSliderObject(), setCurrentSlider(), sliderPressed(), sliderReleased(), sliderValueChanged(), and CopasiSlider::updateSliderData(). Referenced by createNewSlider(), and editSlider(). Definition at line 1074 of file SliderDialog.cpp. Definition at line 382 of file SliderDialog.cpp. References clearSliderBox(), mSliderMap, and pdelete. Referenced by reset(), and ~SliderDialog(). Definition at line 1043 of file SliderDialog.cpp. Referenced by clear(), and setCurrentFolderId(). Definition at line 867 of file SliderDialog.cpp. Definition at line 126 of file SliderDialog.cpp. References findCopasiSliderAtPosition(), mpaCreateNewSlider, mpaEditSlider, mpaRemoveSlider, mpContextMenu, and setCurrentSlider(). Definition at line 171 of file SliderDialog.cpp. References addSlider(), CSlider::compile(), determineCorrectObjectForSlider(), equivalentSliderExists(), findCopasiSliderForCSlider(), getCSlidersForCurrentFolderId(), CCopasiRootContainer::getDatamodelList(), CCopasiObject::getKey(), CCopasiSelectionDialog::getObjectVector(), getTaskForFolderId(), CQMessageBox::information(), CQSimpleSelectionTree::InitialTime, mChanged, mCurrentFolderId, CQSimpleSelectionTree::Parameters, CSlider::resetRange(), CSlider::setAssociatedEntityKey(), CSlider::setSliderObject(), and CopasiSlider::updateSliderData(). Definition at line 600 of file SliderDialog.cpp. References C_INVALID_INDEX, deleteSlider(), editSlider(), getCopasiSliderForCSlider(), getCSliderForCopasiSlider(), getCSlidersForCurrentFolderId(), CopasiUI3Window::getDataModel(), CQMessageBox::information(), mChanged, mCurrentFolderId, mpCurrSlider, mpParentWindow, mSliderMap, removeSlider(), setCorrectSliderObject(), setCurrentSlider(), sliderPressed(), sliderReleased(), and sliderValueChanged(). Deletes all sliders for the current folder id that are no longer valid. Definition at line 1268 of file SliderDialog.cpp. References CQMessageBox::information(), CopasiSlider::isValid(), mCurrentFolderId, mSliderMap, and removeSlider(). Referenced by fillSliderBox(), and updateAllSliders(). Definition at line 312 of file SliderDialog.cpp. References mChanged, mCurrentFolderId, mSliderMap, and pdelete. Referenced by createSlidersForFolder(), and removeSlider(). Definition at line 1126 of file SliderDialog.cpp. References CMetab::getInitialConcentrationReference(), CModelEntity::getInitialValueReference(), CMetab::isInitialConcentrationChangeAllowed(), mFramework, and pResult. Referenced by createNewSlider(), and setCorrectSliderObject(). Definition at line 990 of file SliderDialog.cpp. Definition at line 338 of file SliderDialog.cpp. References addSlider(), CopasiSlider::getCSlider(), getCSlidersForCurrentFolderId(), CCopasiRootContainer::getDatamodelList(), SliderSettingsDialog::getSlider(), getTaskForFolderId(), mCurrentFolderId, mpCurrSlider, SliderSettingsDialog::setDefinedSliders(), SliderSettingsDialog::setModel(), SliderSettingsDialog::setSlider(), and CopasiSlider::updateSliderData(). Referenced by addSlider(), createSlidersForFolder(), editSlider(), and SliderDialog(). Definition at line 456 of file SliderDialog.cpp. References CSlider::getAssociatedEntityKey(), CCopasiRootContainer::getDatamodelList(), SCopasiXMLGUI::getSliderList(), CSlider::getSliderObject(), pResult, and CCopasiVector< T >::size(). Referenced by addSlider(), and createNewSlider(). Definition at line 1085 of file SliderDialog.cpp. Definition at line 662 of file SliderDialog.cpp. References createSlidersForFolder(), deleteInvalidSliders(), CModelEntity::getInitialExpression(), CCopasiObject::getObjectParent(), mCurrentFolderId, mpCurrSlider, mpParentWindow, mSliderMap, CopasiSlider::object(), setCurrentSlider(), and CopasiSlider::updateSliderData(). Definition at line 157 of file SliderDialog.cpp. Referenced by contextMenuEvent(), and eventFilter(). Definition at line 478 of file SliderDialog.cpp. References CopasiSlider::getCSlider(), mCurrentFolderId, mSliderMap, and pResult. Definition at line 581 of file SliderDialog.cpp. Definition at line 562 of file SliderDialog.cpp. Definition at line 1056 of file SliderDialog.cpp. References getCSlidersForObject(), getTaskForFolderId(), and mCurrentFolderId. Referenced by createNewSlider(), createSlidersForFolder(), and editSlider(). Definition at line 996 of file SliderDialog.cpp. 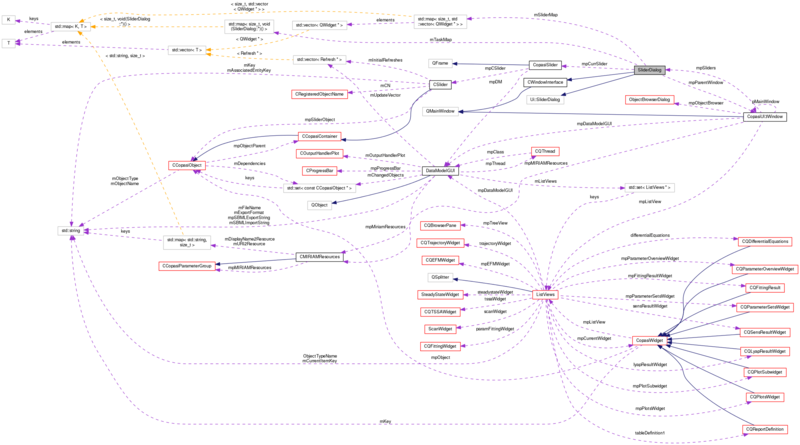 References CSlider::compile(), CSlider::getAssociatedEntityKey(), CCopasiRootContainer::getDatamodelList(), CCopasiDataModel::getGUI(), CModel::getKey(), CCopasiObject::getKey(), CCopasiDataModel::getModel(), SCopasiXMLGUI::getSliderList(), CQMessageBox::information(), CCopasiVector< T >::remove(), CCopasiVector< T >::size(), and sliderObjectChanged(). Definition at line 877 of file SliderDialog.cpp. Referenced by createNewSlider(), editSlider(), and getCSlidersForCurrentFolderId(). Definition at line 1325 of file SliderDialog.cpp. Definition at line 405 of file SliderDialog.cpp. Returns whether the slider dialog contains changes. Definition at line 1315 of file SliderDialog.cpp. Referenced by CopasiUI3Window::importSBMLFromString(), CopasiUI3Window::newDoc(), CopasiUI3Window::slotFileOpen(), CopasiUI3Window::slotImportSBML(), and CopasiUI3Window::slotQuit(). Definition at line 717 of file SliderDialog.cpp. References C_INVALID_INDEX, folderMappings, and numMappings. Referenced by getTaskForFolderId(), and setCurrentFolderId(). Definition at line 984 of file SliderDialog.cpp. Definition at line 288 of file SliderDialog.cpp. References deleteSlider(), CopasiSlider::getCSlider(), CCopasiRootContainer::getDatamodelList(), mpCurrSlider, CCopasiVector< T >::remove(), and CCopasiVector< T >::size(). Referenced by addSlider(), createSlidersForFolder(), deleteInvalidSliders(), removeSlider(), and SliderDialog(). Resets the SliderDialog to its initial state. It basically calls clear and readds the Label for the task widgets that don't support sliders. Definition at line 1305 of file SliderDialog.cpp. References C_INVALID_INDEX, clear(), and mSliderMap. Referenced by CopasiUI3Window::newDoc(), CopasiUI3Window::slotFileOpen(), and CopasiUI3Window::slotImportSBML(). Definition at line 1099 of file SliderDialog.cpp. Definition at line 847 of file SliderDialog.cpp. References CopasiWidget::enter(), ListViews::getCrossSectionWidget(), CCopasiRootContainer::getDatamodelList(), CopasiUI3Window::getMainWidget(), mpParentWindow, and CQCrossSectionTaskWidget::runTask(). Definition at line 827 of file SliderDialog.cpp. References CopasiWidget::enter(), CCopasiRootContainer::getDatamodelList(), ListViews::getLNAWidget(), CopasiUI3Window::getMainWidget(), mpParentWindow, and CQLNAWidget::runTask(). Definition at line 817 of file SliderDialog.cpp. References CopasiWidget::enter(), CCopasiRootContainer::getDatamodelList(), CopasiUI3Window::getMainWidget(), ListViews::getMCAWidget(), mpParentWindow, and CQMCAWidget::runTask(). Definition at line 857 of file SliderDialog.cpp. References CopasiWidget::enter(), CCopasiRootContainer::getDatamodelList(), CopasiUI3Window::getMainWidget(), ListViews::getOptimizationWidget(), mpParentWindow, and CQOptimizationWidget::runTask(). Definition at line 837 of file SliderDialog.cpp. References CopasiWidget::enter(), CCopasiRootContainer::getDatamodelList(), ListViews::getFittingWidget(), CopasiUI3Window::getMainWidget(), mpParentWindow, and CQFittingWidget::runTask(). Definition at line 807 of file SliderDialog.cpp. References CopasiWidget::enter(), CCopasiRootContainer::getDatamodelList(), CopasiUI3Window::getMainWidget(), ListViews::getScanWidget(), mpParentWindow, and ScanWidget::runTask(). Definition at line 799 of file SliderDialog.cpp. References CopasiUI3Window::getMainWidget(), ListViews::getSteadyStateWidget(), mpParentWindow, and SteadyStateWidget::runTask(). Definition at line 734 of file SliderDialog.cpp. References ListViews::findWidgetFromId(), CopasiUI3Window::getMainWidget(), TaskWidget::leave(), mCurrentFolderId, mpParentWindow, mTaskMap, and updateAllSliders(). Referenced by SliderDialog(), sliderReleased(), and sliderValueChanged(). Definition at line 789 of file SliderDialog.cpp. References CopasiWidget::enter(), CCopasiRootContainer::getDatamodelList(), CopasiUI3Window::getMainWidget(), ListViews::getTrajectoryWidget(), mpParentWindow, and CQTrajectoryWidget::runTask(). Sets the changed state of the SliderDialog. Definition at line 1320 of file SliderDialog.cpp. Referenced by CopasiUI3Window::CopasiUI3Window(), CopasiUI3Window::newDoc(), and CopasiUI3Window::slotFileSaveFinished(). Takes a CopasiSlider object and checks if the associated model object fits the currently set framework. If not, the slider object and the values are adjusted. Definition at line 1230 of file SliderDialog.cpp. References determineCorrectObjectForSlider(), CopasiSlider::maxValue(), CopasiSlider::minValue(), CopasiSlider::object(), CopasiSlider::setMaxValue(), CopasiSlider::setMinValue(), CopasiSlider::setObject(), and CopasiSlider::value(). Referenced by addSlider(), createSlidersForFolder(), and setFramework(). Definition at line 501 of file SliderDialog.cpp. References C_INVALID_INDEX, clearSliderBox(), fillSliderBox(), mapFolderId2EntryId(), mCurrentFolderId, and mpParentWindow. Referenced by CopasiUI3Window::CopasiUI3Window(), CopasiUI3Window::listViewsFolderChanged(), and SliderDialog(). Definition at line 147 of file SliderDialog.cpp. Referenced by addSlider(), contextMenuEvent(), createSlidersForFolder(), editSlider(), eventFilter(), fillSliderBox(), removeSlider(), and sliderValueChanged(). Definition at line 1104 of file SliderDialog.cpp. References mpCurrSlider, CopasiSlider::setOriginalValue(), and CopasiSlider::value(). Definition at line 1179 of file SliderDialog.cpp. References mFramework, mSliderMap, CopasiSlider::object(), and setCorrectSliderObject(). Definition at line 1118 of file SliderDialog.cpp. Definition at line 1261 of file SliderDialog.cpp. Definition at line 1109 of file SliderDialog.cpp. Definition at line 784 of file SliderDialog.cpp. Referenced by addSlider(), and createSlidersForFolder(). Definition at line 773 of file SliderDialog.cpp. References mSliderPressed, mSliderValueChanged, and runTask(). Definition at line 756 of file SliderDialog.cpp. References CCopasiRootContainer::getConfiguration(), mpCurrSlider, mSliderPressed, mSliderValueChanged, runTask(), setCurrentSlider(), and CConfigurationFile::useAdvancedSliders(). Definition at line 925 of file SliderDialog.cpp. References C_INVALID_INDEX, deleteInvalidSliders(), CopasiUI3Window::getDataModel(), mCurrentFolderId, mpParentWindow, mSliderMap, DataModelGUI::refreshInitialValues(), CopasiSlider::updateSliderData(), and CopasiSlider::updateValue(). Referenced by CopasiUI3Window::disableSliders(), runTask(), and showEvent(). Definition at line 104 of file SliderDialog.h. Definition at line 177 of file SliderDialog.h. Referenced by addSlider(), createNewSlider(), createSlidersForFolder(), deleteSlider(), isChanged(), and setChanged(). Definition at line 171 of file SliderDialog.h. Referenced by addSlider(), clearSliderBox(), createNewSlider(), createSlidersForFolder(), deleteInvalidSliders(), deleteSlider(), editSlider(), fillSliderBox(), findCopasiSliderForCSlider(), getCSlidersForCurrentFolderId(), runTask(), setCurrentFolderId(), and updateAllSliders(). Definition at line 174 of file SliderDialog.h. Referenced by determineCorrectObjectForSlider(), and setFramework(). Definition at line 163 of file SliderDialog.h. 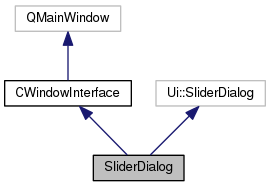 Referenced by contextMenuEvent(), and SliderDialog(). Definition at line 165 of file SliderDialog.h. Definition at line 164 of file SliderDialog.h. Definition at line 166 of file SliderDialog.h. Definition at line 167 of file SliderDialog.h. Definition at line 162 of file SliderDialog.h. Definition at line 168 of file SliderDialog.h. Referenced by addSlider(), changeEvent(), createSlidersForFolder(), editSlider(), fillSliderBox(), removeSlider(), resetValue(), setCurrentSlider(), setDefault(), and sliderValueChanged(). Definition at line 161 of file SliderDialog.h. Referenced by addSlider(), closeEvent(), createSlidersForFolder(), fillSliderBox(), runCrossSectionTask(), runLNATask(), runMCATask(), runOptimizationTask(), runParameterEstimationTask(), runScanTask(), runSteadyStateTask(), runTask(), runTimeCourse(), setCurrentFolderId(), setParentWindow(), SliderDialog(), updateAllSliders(), and ~SliderDialog(). Definition at line 169 of file SliderDialog.h. Referenced by addSlider(), clear(), clearSliderBox(), createSlidersForFolder(), deleteInvalidSliders(), deleteSlider(), fillSliderBox(), findCopasiSliderForCSlider(), reset(), setFramework(), SliderDialog(), and updateAllSliders(). Definition at line 173 of file SliderDialog.h. Referenced by sliderPressed(), sliderReleased(), and sliderValueChanged(). Definition at line 172 of file SliderDialog.h. Referenced by sliderReleased(), and sliderValueChanged(). Definition at line 170 of file SliderDialog.h. Referenced by runTask(), and SliderDialog(). Definition at line 103 of file SliderDialog.h.